BYOND Forums - BYOND Help - I opened BYOND today and got this. I did reinstall BYOND for 5 times, even found the site where all the versions, starting from 354 to latest are listed. 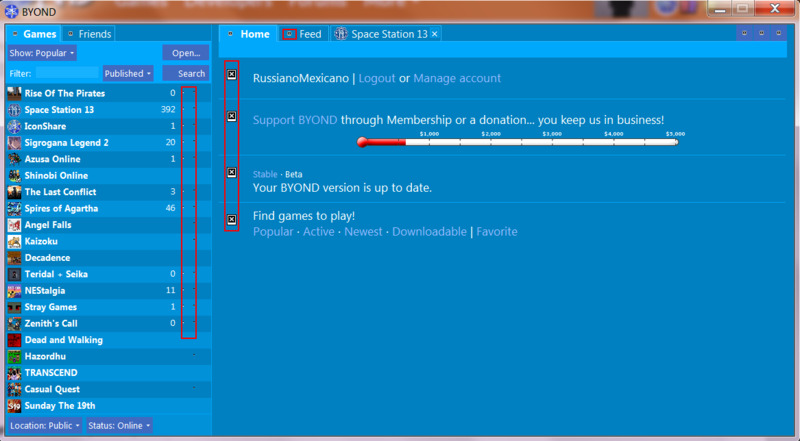 I added BYOND in ignore list in my antivirus, but it doesn't work either. It's like an dead icon or something, when an image can't load. Please help with this, it is very confusing. Edit: Same thing on the "Stable" version. Go to Preferences | Advanced and open up your BYOND user directory. Then close your pager completely so byond.exe no longer shows up in the task manager. Then, in the folder you opened, find the folder called "pager" and rename it to something else. My suspicion is some of your permissions got messed up. Letting BYOND recreate the folder should fix that if so. If that doesn't fix it, I would ask if anything changed on your system since the last time you opened the pager and everything was correct. Change to a display setting? Updated/installed any particular software? Yup, that helped. Thank you for your time.